A peek into the exhibit halls of the Indiana Convention Center during the National Catholic Youth Conference (NCYC) in Indianapolis on Nov. 21-23 would show different aspects of the faith. A bishop talked about turning off electronic devices to find time for God. A priest discussed how to combine fitness and prayer time. And on a stage in a large exhibit hall, comedian Judy McDonald commented on the questions she is asked because of her service dog, Daisy. “They’ll ask if I’m blind—while I’m texting,” she jokes. McDonald and Daisy were part of the Saturday afternoon recreation portion of NCYC in an hour-and-a-half session called the Comedy Club. The pair was joined by seven other comedy acts to lighten the mood after two-and-a-half days of praise, worship and faith-growing sessions. “Comedy is in our life every day, like depression and dinner and pancakes and snot,” said McDonald, a lifetime Catholic and former youth and campus minister. “Life is life. I think we tend to compartmentalize God into a separate area, and he doesn’t want that. He wants all of it. McDonald, who lives in San Diego, sees comedy as a form of the new evangelization. McDonald has been performing as a comedian for 20 years. She started doing comedy on the side while a freshman at the University of San Diego. After graduating, McDonald served as campus minister for her alma mater. Later, while working as youth minister for a junior high school, she felt a push toward full-time comedy—out of necessity. She switched to full-time comedy in 2003, speaking at faith-based conferences, Life Teen events and parishes. Soon she was invited to go overseas to perform at garrisons and army bases. That led to speaking at parishes in Ireland and other countries, and eventually large venues like NCYC. But all was not comedy and laughter in McDonald’s life. “My childhood was not particularly good, and no one knew about it until I was about 30,” she said. As a result of the incidents of her past, McDonald has suffered from Post-Traumatic Stress Disorder (PTSD) for the last three years. “My doctor said getting a service dog would be good for me, but that it was $10,000. I didn’t exactly have that in the cookie jar,” she said. McDonald prayed about what to do. She decided to send a letter to all those for whom she’d worked in the past, as well as adding the plea to her Facebook fan page. Within two weeks, McDonald had the $10,000. “I really feel like God gave me [my service dog] Daisy,” she said. 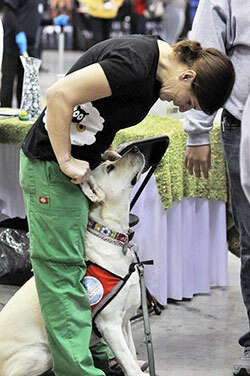 “She came from the aptly named ‘Little Angels Service Dogs’ in San Diego. She alerts me when I’m going to have a panic attack or flashback or nightmares,” McDonald explained. The dog has proven to be a blessing in her comedic ministry as well. “She’s great after shows when kids want to come up and talk to me,” said McDonald. “She’s that extra push that comforts kids if they want to share something with me. I’m someone from out of town, and they may not be comfortable telling their youth minister, but they’ll talk to me. “Of course, I then tell them to share it with their youth minister or priest or mom,” she said. McDonald is a fan of NCYC, and not just for the economic opportunity it provides. “I love this venue. It’s so great for the kids to see before they go off to college that it’s OK to be Catholic. “If I’d known what these kids are learning here, I would have stayed Catholic out of love instead of fear,” she admitted. “It’s so great to see them having fun and doing it because they want to do it. Now their kids are going to learn, and it’s just going to build. “These kids aren’t the Church of the future, they’re the Church right now,” said McDonald. “Anybody could come here and have hope. If anyone is disillusioned about the Church, they need to come here and see this.